As the sun began to rise, the morning after the evening they met, Lauren and Adam knew they had found something special when they realised they hadn’t stopped talking! Some time later while on a stopover in Singapore en route to Europe, Adam’s excitement got the better of his plans to propose in Spain, and he popped the question in front of their Marina Bay Sands suite overlooking a magnificent panoramic view of the city. With a proposal as dazzling and breathtaking as that, Lauren and Adam knew they wanted their big day to continue with a relaxed, but elegant vibe. The couple dreamt of celebrating their wedding in style, however the details were a little up in the air. 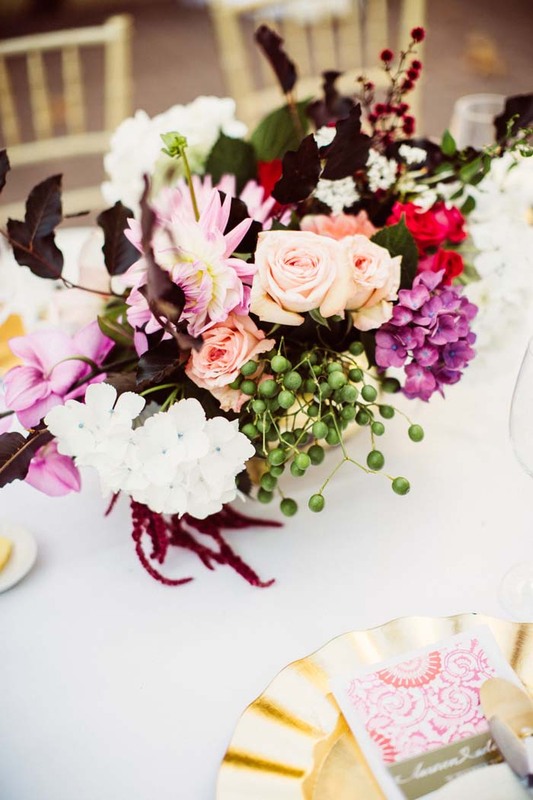 “We brought Cathrin D’Entremont, our wedding planner and stylist, on board before we even had a date and venue picked out.” The couple felt they needed experienced and intuitive advice, “I can’t take credit for the styling - we didn’t even have any ideas!” Lauren light-heartedly admits. Cathrin helped the couple to define exactly what they were after. As they had their hearts set on hosting a New Years Eve wedding, the décor followed suit. A colour scheme of gold, pink, fuchsia, and white with red accents popped up throughout the ceremony in bold bouquets and flowed into the reception marquee with beautiful draping fabrics, table adornments, and statement pieces such as a glamorous crystal chandelier that sparkled above the dance floor. In lieu of traditional bomboniere, bridesmaids handed out ‘Happy New Year’ tiaras and 2015 champagne flutes before the countdown to midnight. A few perfect finishing touches helped to execute the couple’s ‘relaxed elegance’ theme perfectly. The venue, Lamont’s at Bishops House, was a vintage garden escape set against the backdrop of Perth’s modern city skyline. And of course Lauren’s mermaid cut Vera Wang gown helped to add captivating drama to the impeccably styled event!